Gun violence is an epidemic in our country. It's well past time for us all to take a stand and fight for policy change in America. The Second Amendment wasn't written for silencers and automatic weapons. Firearms have changed, and so too must our relationship with them, including the laws that keep us safe from gun violence. Below are a series of actions you can take at the National and State level to bring about common sense reforms of firearms-related law, and to fight the gun violence crisis in America. 1. OPPOSE the Deregulation of Silencers contained within the SHARE Act. One of the ways police were able to quickly locate the shooter in Las Vegas was by the sound and flash from his weapons when he fired. Neither of these things would have been perceivable had he been using a silencer. The sound of the gun fire also cued concert goers to seek cover and protect one another, helping survivors save their own lives along with countless others. Currently, the US Congress is considering legislation called the SHARE Act that, among other things, would remove most regulations around silencers, a move opposed by both military and police forces. 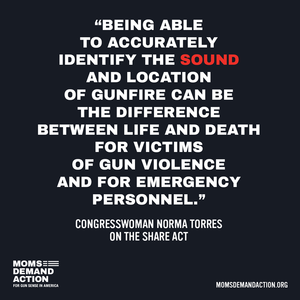 Write your representative and ask them to remove the remove the gun silencer provision from the SHARE Act because we shouldn't be making it easy for convicted felons and domestic abusers to buy guns silencers without a back ground check. See link at right to send a letter now. Call your representative and demand the same thing. Dial 202-224-3121, opt 2 to be connected with your Congressperson. Text SILENCER to 64433 to join Everytown in their fight against this measure. 2. OPPOSE Concealed Carry Reciprocity US Senate Bill 446 would "force all 50 states to allow stalkers, domestic abusers, and people with no safety training to carry hidden, loaded guns in public -- even the legally blind." (credit Everytown) This dangerous legislation is a step in the wrong direction. 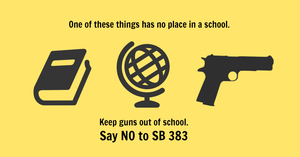 SB 446 is currently in the Senate Judiciary Committee, so neither of our Senators can oppose at the moment. However, it would be useful to express your disapproval for the bill now, as things can change quickly. Call your Senator and tell them to oppose SB 446, Concealed Carry Reciprocity, should it ever come to the floor. Toomey: 202-224-4254. Casey: 202-224-6324. Script: "Hello, my name is ____. I'm a constituent from ________. I'm calling to ask you to vote no on SB 446, the Concealed Carry Reciprocity bill, should it ever come to the floor. Thank you." 3. SUPPORT a Federal Ban on Bump-Stocks, the firearm modification that allows some guns to fire as quickly as automatic weapons (see explanation here). Bump-stocks were found on 12 of the weapons used in the Las Vegas shooting, and are what allowed the shooter to injure and kill so many people in such a short amount of time. Legislation with bi-partisan support for a ban on bump-stocks has been proposed in both the House and the Senate. Call your legislator and tell them that you support a ban on bump-stocks. Find phone numbers and scripts at 5 Calls. Send a letter to your legislators asking them to support the ban. See link at right to send a letter now. 4. Ask Your Representatives to Return NRA Campaign Contributions. Ask your legislator to donate any campaign contributions he received from the NRA to a Gun Violence Prevention organization like Everytown for Gun Safety, the Brady Center for Gun Violence Prevention, Mom's Demand Action PA, or Cease Fire PA. Then ask him to commit to never accepting NRA or other Firearm Advocacy group contributions again. As of October 6th, Congressmen Tim Ryan and Tim Walz donated money to charitable organizations in the amount of campaign donations they had received from the NRA. (story here) It's time for us to break the strangle-hold the NRA has on this country, and one way to do that is to take away its financial power. Demand that your legislator return his or her contributions as well. Call your legislator (find their contact info here) and demand that they donate those contributions to charity and pledge to stop accepting NRA money moving forward. 5. SUPPORT funding for the CDC to research gun violence prevention and gun safety. "In 1996, the Republican-majority Congress threatened to strip funding from the Centers for Disease Control and Prevention unless it stopped funding research into firearm injuries and deaths. The National Rifle Association accused the CDC of promoting gun control. As a result, the CDC stopped funding gun-control research — which had a chilling effect far beyond the agency, drying up money for almost all public health studies of the issue nationwide." (Washington Post, read more) As a result, we know basically nothing about how to effectively prevent gun violence of any type. Legislation (H.R.1832/S.834) has been proposed that would fund $10 million for the Centers for Disease Control to research gun violence prevention and firearm safety. Your legislators need to know that you support these bills. Call or email your legislators and ask them to support H.R. 1832 / S. 834. Script/Text: "Hello my name is _____________ and I’m a constituent from ____________. Please support H.R.1832/S.834 —a bill that will fund $10 million for the Centers for Disease Control to research gun violence prevention and firearm safety. Gun violence in our country is at historic proportions. We need to know why and how to effectively stop it. Thank you." 6. 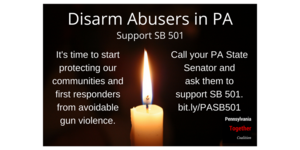 Support Federal Senate bill S1539, which would remove guns from those convicted of domestic abuse and stalking. Ask your Senator to cosponsor. To contact your Senator through Everytown, text ENOUGH to 64433 (you’ll get a call back with instructions on what to say, and then be connected to your senator’s office to make your statement), or write them a message by using at form at http://every.tw/2hgcItq. You can also contact your Senators on your own by phone, email, or fax. Bob Casey and Pat Toomey. PA SB 27 Requires an individual to serve a mandatory minimum one-year sentence for unlawfully carrying a firearm without a license on their person or in a vehicle. PA SB 28 Would temporarily bar those charged with violent felonies from purchasing or possessing firearms. PA SB 29 Would correct disparate treatment of juvenile adjudications for disabling offenses. 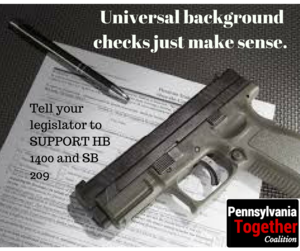 PA SB 209 and HB 1400 Background Checks for Firearms and 48-hour Checks for Gun Shows. See link at right to send a letter now. There a number of groups fighting to eliminate gun violence in the US. Here are a few you can connect with and support.